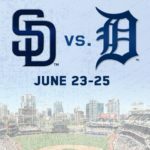 This game will start a three game series between the Detroit Tigers and the San Diego Padres, which is going to be played at the San Diego Padres. The San Diego Padres are coming from a three game series against the Chicago Cubs, which they started by losing the first two games, by 3 – 2 and 4 – 0 results. In the third game, they were able to bounce back to get a win, which ended 3 – 2 and even if they have lost the series already, it helped them in coming into this series with better form. At the time of writing, the Tigers have not finished their last series, which was a four game series against the Seattle Mariners, which they started by losing three games in a row, with them ending 6 – 2, 5 – 4 and 7 – 5. These two teams are having very different season, but neither of them have been particularly great. The Tigers, have won thirty two and lost thirty nine of their seventy one games in 2017, for a winning percentage of .451 that has them as the fourth placed team in the central division of the American League, three games behind the Kansas City Royals in third place, five games behind the Minnesota Twins in second place, and six and a half games behind the Cleveland Indians in first place. They have to visit the Padres in San Diego with an away record that has been bad, winning fourteen of the thirty three games played away from home, for a .378 away winning percentage. The Padres, on the other hand, have had a pretty disastrous season, having only won twenty nine and lost forty four of the seventy three games they have played in 2017, for a .397 winning percentage that has them in the fourth spot of the western division of the National League, eighteen games behind the division’s leaders, the Los Angeles Dodgers, but two games and a half ahead of the San Francisco Giants in last place. They receive the Tigers with an Ok at best home performances, having won seventeen and lost eighteen of the thirty five games they have played at home, for a winning percentage of .486 when playing in front of their home crowd. These two teams come from very different forms, with the Tigers having lost six games in a row, while the Padres have won their last game. The Tigers have only been able to get two wins in their last ten games, while the Padres have won five and lost five. The probable starting pitcher for the Tigers will be Michael Fulmer, and the sophomore will be making his fourteenth start of the year. In his previous games in 2017, he got six wins, five losses and only two games without a decision. He has pitched 86 innings, allowing 82 hits, 35 runs and 4 home runs, while also striking out 63 batters, for a good ERA of 3.45. Luis Perdomo will be the starting pitcher on the mound for the San Diego Padres, and he will be tasked with stopping the Cubs batters. The Dominican will be starting his thirteenth in 2017, where his past games have not been so great. He has a single win this season, having lost four and without deciding the other seven. He has pitched in 67 innings, allowing 74 hits, 40 runs and 9 home runs, with a pretty bad ERA of 4.97 and striking out 55 players. He has never started against the Detroit in his career, and he will try and perform better than he has all season. We believe the Tigers will be able to get this first win and with the total being set at 7.5, we believe you should go for the under.